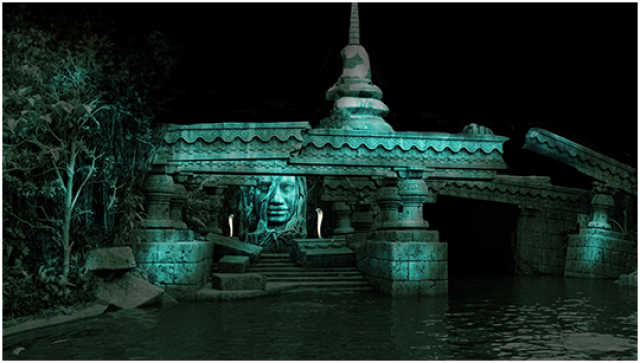 Oriental Land Company Ltd. vient d'annoncer la fermeture de l'attraction Jungle Cruise le 6 janvier 2014. L'attraction ré-ouvrira à l'automne 2014 dans une version remaniée pour un coût total estimé à 1,6 milliards de yens. 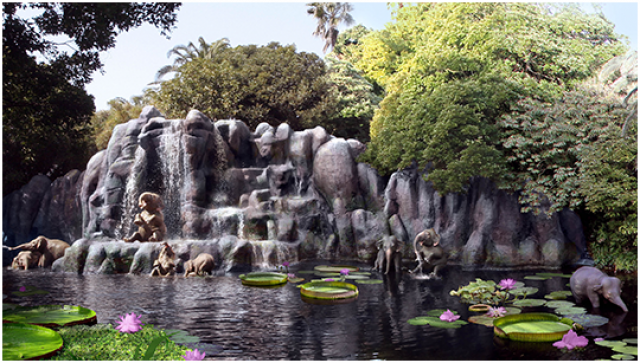 URAYASU, CHIBA— Oriental Land Co., Ltd. announced that the Tokyo Disneyland® attraction, Jungle Cruise, located in Adventureland, will be revamped with the new version opening in autumn 2014. 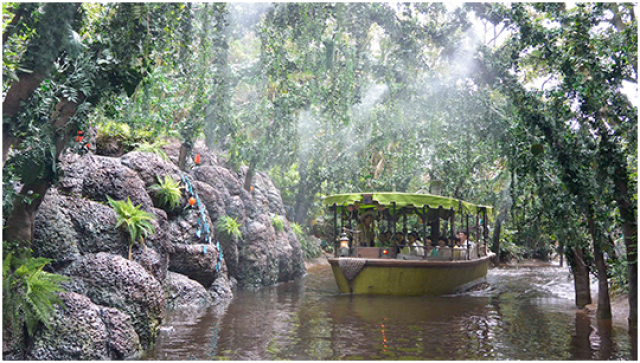 The Jungle Cruise, which has been popular since Tokyo Disneyland Park opened in 1983, takes Guests on an adventurous cruise through the jungles with a humorous skipper at the helm. 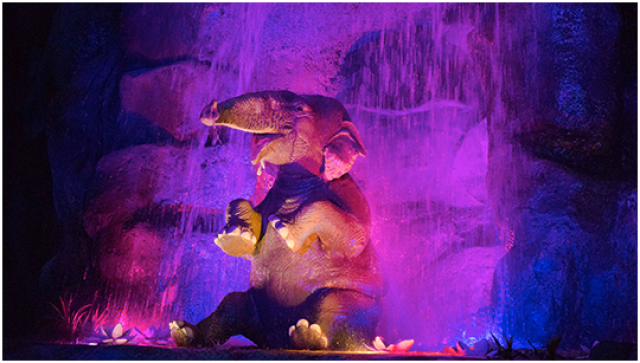 The revamped version of the attraction will have new lighting effects and other special show effects. 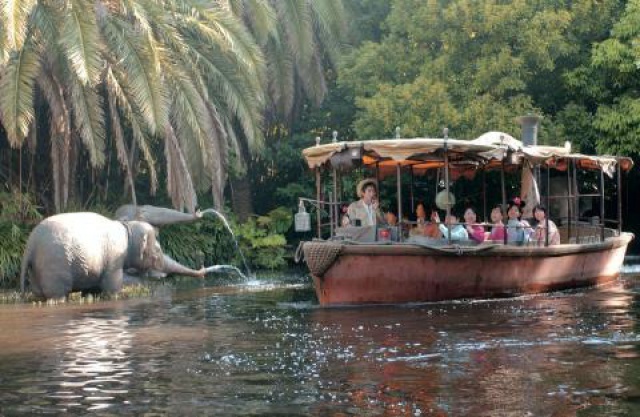 In addition, a specially written musical sound track will be heard throughout the attraction for the first time in any Jungle Cruise. 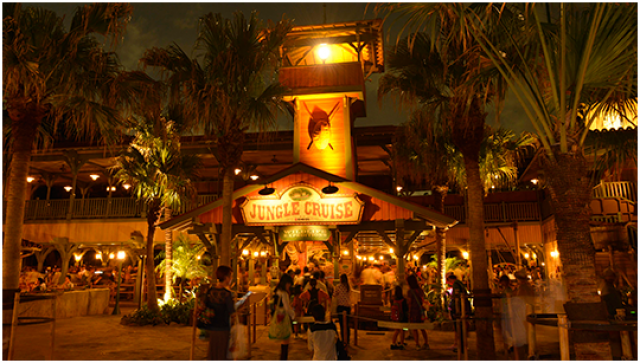 Also, an after-dark only “night cruise” will provide a unique take on the jungle adventure. 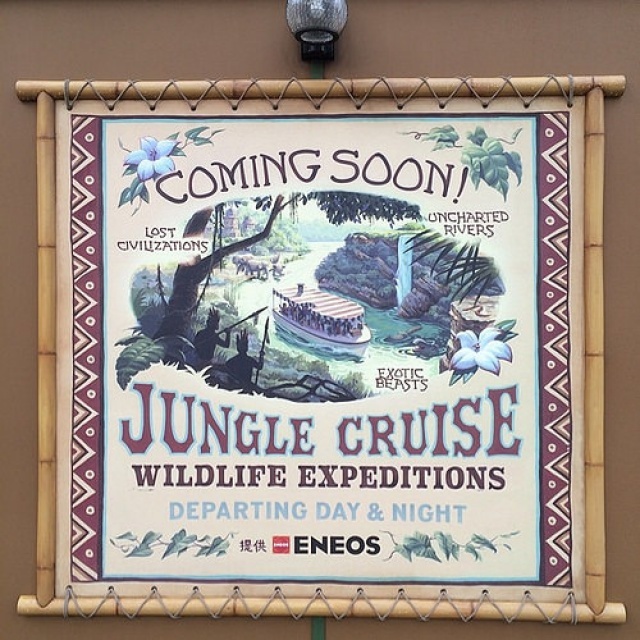 The new Jungle Cruise will offer Guests an adventure that is even more thrilling than before. 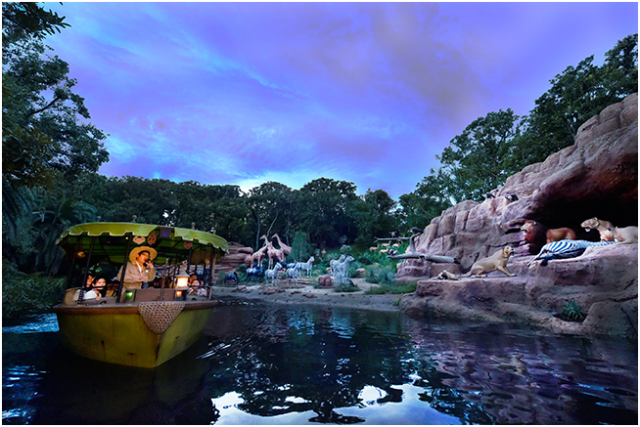 From on board the attraction’s boats, Guests will explore jungle landscapes full of wild animals with the help of their daring and comical skipper who guides them through the beauty and dangers of this exotic world. The adventure includes a startling encounter with one of the animal spirit guardians in the ruins of a lost jungle temple. 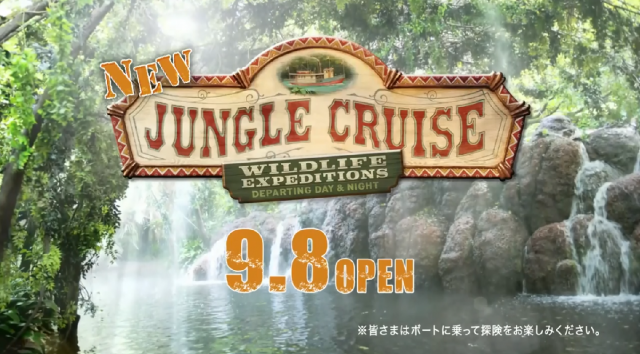 Note : Jungle Cruise is sponsored by JX Nippon Oil & Energy Corporation. The attraction will be closed from January 6, 2014 for this renovation work. On parit que l'update va suivre outre pacifique ? 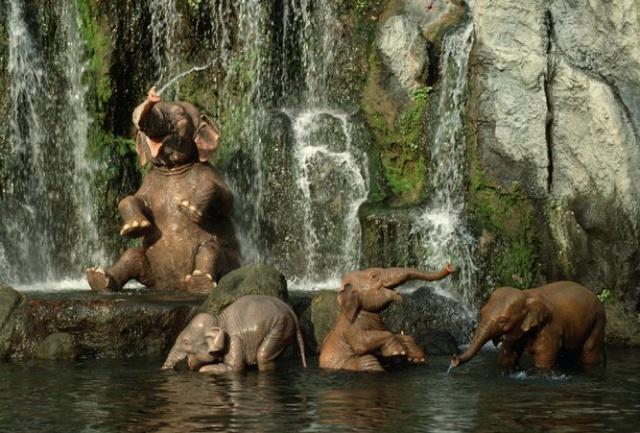 One of the most beloved attractions at our parks around the world is the Jungle Cruise. A fan favorite since the original opened at Disneyland in 1955, each trip down the world’s most famous rivers offers excitement and humor – and now, guests at Tokyo Disneyland are in for a special treat. 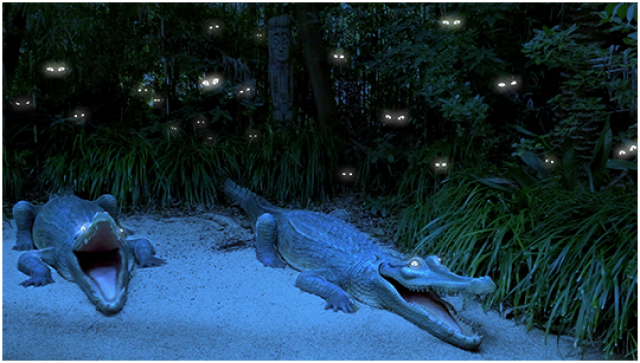 Tokyo Disney Resort recently announced that the Jungle Cruise will undergo a wild transformation in 2014, with new lighting and show effects, an exclusive musical soundtrack, and a special after-dark “night cruise” for a unique take on this classic attraction. 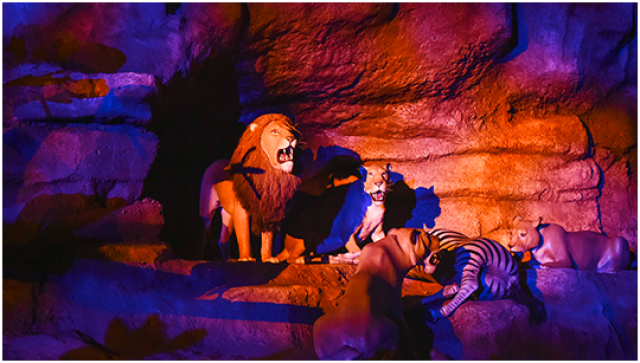 Inspired by Disney’s award-winning True-Life Adventure films, the original attraction has evolved into an exciting and lighthearted journey, infused in the 1960s with drama and humor by one of Walt’s most celebrated animators, Marc Davis. Travelers venture down the Mekong River, the Nile, the Amazon, and to the African Congo, guided by an intrepid skipper – known just as much for bravery as for quick wit. 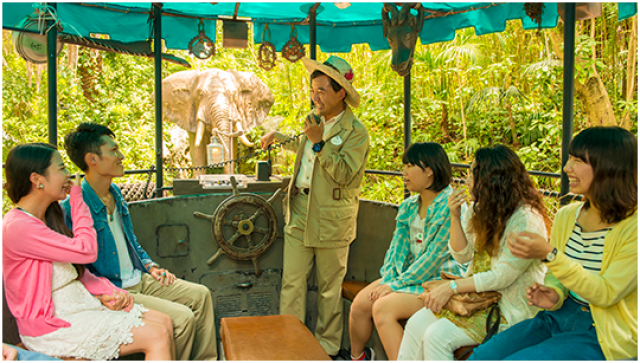 The attraction is a true international hit too – the Jungle Cruise at Hong Kong Disneyland even offers tours in English, Mandarin and Cantonese so that guests can experience their skipper’s narration in their preferred language. 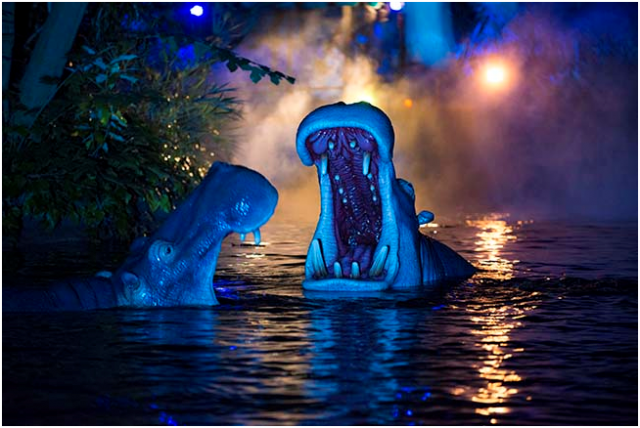 There are also a few supernatural thrills in store as Tokyo Disneyland cruisers encounter animal spirit guardians in the ruins of a lost jungle temple. 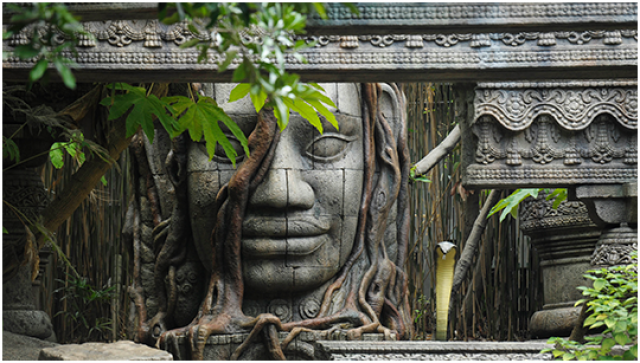 Whether you’re a seasoned sailor or it’s your first time down the river, the mysteries of the jungle are sure to mesmerize. We’re looking forward to what new wonders await when this attraction reopens in fall 2014! De janvier jusqu'en automne, ça paraît un peu long. Cela dit, ils auront sûrement leur update avant que l'on ait notre Jack Sparrow. TDR s'est inspiré des concepts arts de SDL ou quoi ? 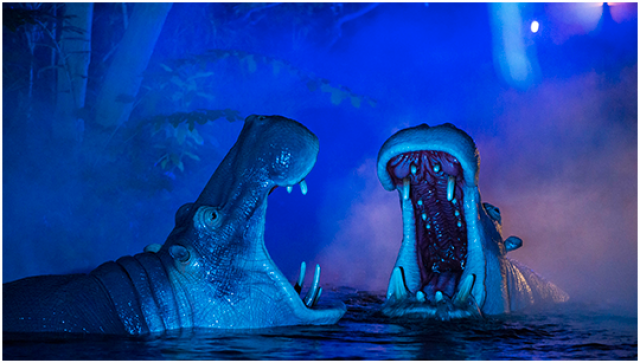 L'attraction Jungle Cruise réouvrira le 8 septembre 2014 dans sa nouvelle version : Jungle Cruise : Wildlife Expedition. Trader Sam toujours présent ! C'est dingue comme la scène du temple me fait penser à Mystic Manor dans le principe! Sinon, mis à part en mode nocturne, peu d'autres changements si ce n'est les musiques! Je ne comprends pas trop ce que vient faire la musique du Roi Lion, ce ne va pas avec l'attraction je trouve! A mon avis, on doit s'attendre à ce que les principaux upgrades d'attractions passent essentiellement par le mapping. C'est finalement assez peu coûteux et très efficace. Ils ont utilisé la même technique pour la nouvelle version du tremblement de terre dans BTM en en Californie. La nouvelle version d'Alice y fait aussi appel. On a eu des mappings plus discrets rajoutés ces dernières années dans Indiana Jones Adventure et Blanche Neige, toujours à Los Angeles. Ce n'est sans doute qu'un début ! Sans oublier les shows comme WOC, Disney Dreams ou encore Once upon a time et meme la nouvelle parade de Hong Kong qui fait appel a beaucoup d'écrans et de nouvelles technologies assez proches du mapping et sans doute aussi sophistiqués. Il y aussi Ratatouille, pas de mapping certe mais de la projection en simulation du réel tout de meme. Des rides comme SMM2 ou l'on propose déjà du mappping depuis 2005 sur les astéroides ainsi que la encore de nombreuses projections. Ce n'est meme plus un début c'est un vraiment l'aboutissement de cette technologie dans nos parcs qui se fait de mieux en mieux. Les projections et le mapping font vraiment leurs effets a Disney et ima les développent a merveille. Mais Mince alors ,c'est une tuerie de nuit .J'imagine avec l'ambiance,de l'évasion pure .C'est de la bombe. Since 1955, guests of Disney Parks around the globe have journeyed through some of the world’s most “dangerous” rivers on Jungle Cruise, guided by a trusty skipper with a brave heart and a clever sense of humor. 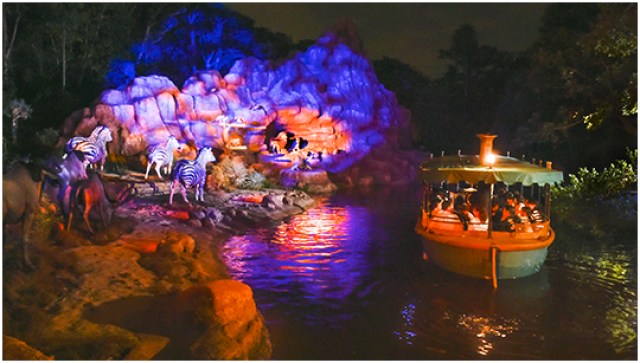 Tokyo Disneyland has just unveiled what might be the attraction’s biggest refurbishment to date with the debut of Jungle Cruise: Wildlife Expeditions, which provides an even more immersive adventure for guests through an increased use of music, interactivity, and a thrilling new nighttime experience. The Imagineers used the queue as an opportunity to introduce elements that will be featured on the cruise. Guests can examine jungle maps, listen to a radio show hosted by DJ skippers, and read thank-you letters—ostensibly written to skippers by past Jungle Cruise passengers—that are posted on a bulletin board that hangs in the attraction. Show Writer Charlie Watanabe reveals, “We tried to plant various seeds in different places. The spiels on the boat are related to what the DJ skippers say over the radio. 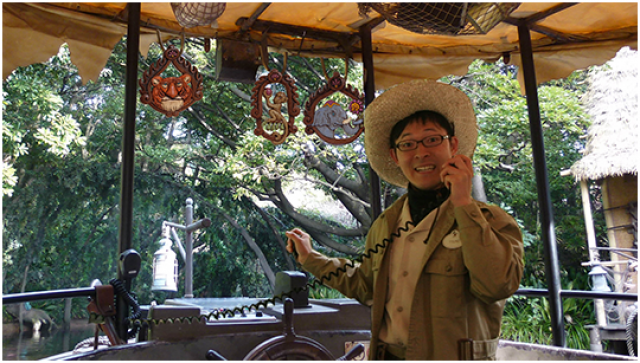 And what the DJ skippers say on the radio is related to the letters.” Since more than 95 percent of park guests in Japan are repeat visitors, it was important to everyone at WDI that they always find something new to discover. The Imagineers also wanted to strengthen the connection that guests have with the jungle itself and allow them to feel that they play a bigger part in the story. 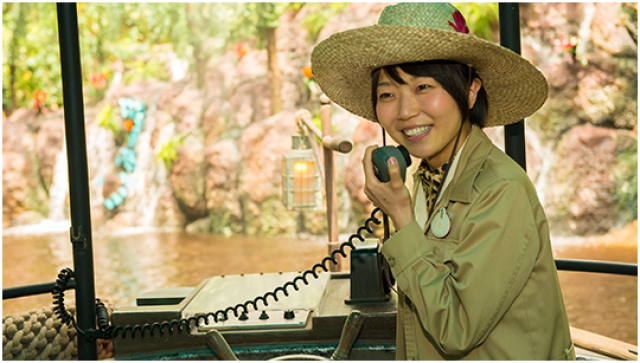 “One of the main stories in this new enhanced version of Jungle Cruise is that animal spirits actually come alive and help us through difficult or dangerous situations,” Watanabe explains. To summon those animal spirits, the skippers rely upon three amulets each representing a specific animal: The tiger symbolizes courage. The elephant stands for strength. And the monkey, of course, is for cleverness. 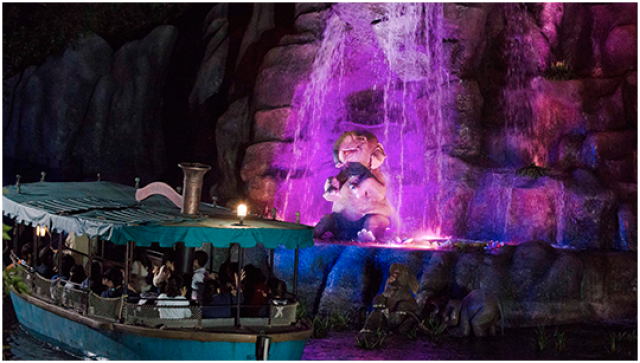 The skipper and guests call upon the animal spirits by making that animal’s sound together during the cruise. Only one animal spirit appears on each cruise, and guests will have no way of knowing which of their boat’s amulets holds the power until a “magical illusion” brings the animal to life on the temple walls—creating the opportunity for multiple storylines that can be woven through the jungle, depending upon the performance of the skipper. “We have two bas reliefs that show the connection of animals in the jungle and people together, so that all comes in harmony,” Rogers details for D23. When the “guardian spirit” recognizes that everyone on the jungle adventure is also a friend of the jungle, the entire environment changes in a very short amount of time. “The stones rebuild themselves, the roots disappear, and the color and the whole temple come to life,” Rogers continues. 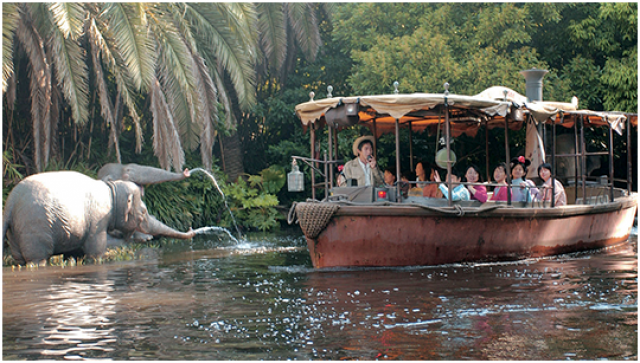 The soundtrack plays an important role in Jungle Cruise: Wildlife Expeditions. “It carries the emotion, whether it’s mystery, humor, or suspense,” Rogers says. This is the first time a Jungle Cruise has featured background music, and the enhancement also marks the debut of a new nighttime experience. 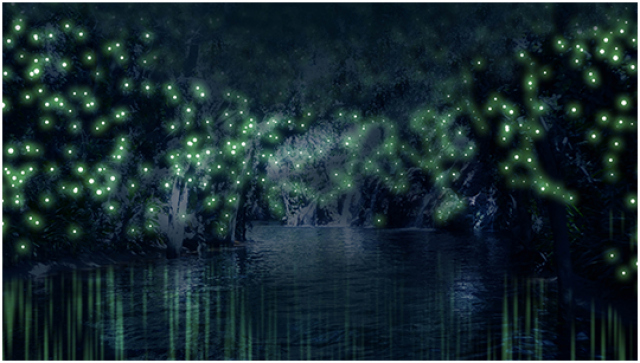 The after-dark cruises feature flickering fireflies, animal eyes that can be seen illuminated in the bushes, and, of course, moonlight. 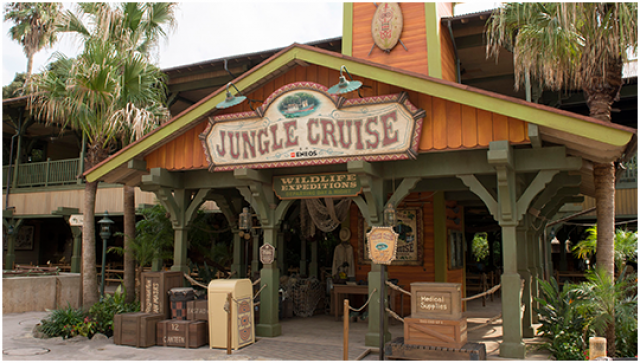 The goal, according to Rogers, was to make these enhancements feel “like they always were there and always belonged there,” as well as to maintain the intent of Marc Davis’ humor and the classic Jungle Cruise puns. 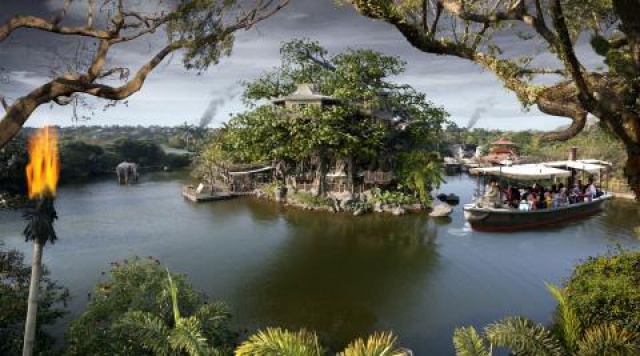 Jungle Cruise: Wildlife Expeditions marks the first time in the 31-year history of Tokyo Disney Resort that a “show script” has been written originally in Japanese, by a Japanese writer. “That is ‘the backside of water’ for Japanese guests,” Rogers explains, referencing the beloved joke U.S. guests associate with Schweitzer Falls (named, as Disney fans all know, for Dr. Albert Falls). D23 can’t help but agree that this jungle is a really good place, indeed. Quelqu'un sait si ce n'est que pour une raison de météo que cette attraction n'existe pas chez nous à Paris car du coté des ponts suspendus il serait bien possible de faire le départ. Météo oui mais aussi nombreuses langues d'Europe qui pose problème car l'humour de cette attraction repose beaucoup sur les commentaires du CM qui conduit le bateau. Entretien lourd également mais aussi doute de la part des imagineers qu'un copié collé de ce ride ( qui date de 55 au passage ) fasse succès au près des Européens c'est pourquoi il y avait des concept arts pour une nouvelle version plus moderne de l'attraction en indoor pour DLP qui n'a jamais été créé.